Many critics have panned it for being “too linear.” JRPGs are linear by nature, though, so this didn’t bother me too much. I’ve always played them for the story more than the gameplay. The battle system was radically different from earlier games–no more turn based, and it’s much more strategy-oriented with Paradigms and Roles and whatnot. To me, this didn’t sound all that different from FF12’s system, combined with the different jobs/roles found in FF9. Just before release I found out that the Japanese audio track was absent even from the PS3 version. This was disappointing, to say the least, and I braced for the worst. Just change the text to English but leave the voices be. Is that too much to ask?!? The beginning is indeed linear–literally. The action takes place on a literal straight line, as in the party walks down a narrow street/corridor with almost no branching. Later you enter a larger area but aside from a few treasure spheres there isn’t anything in the dead-end branches. There definitely isn’t much choice in the very beginning, but this didn’t bother me so much–after all, it’s a prologue. 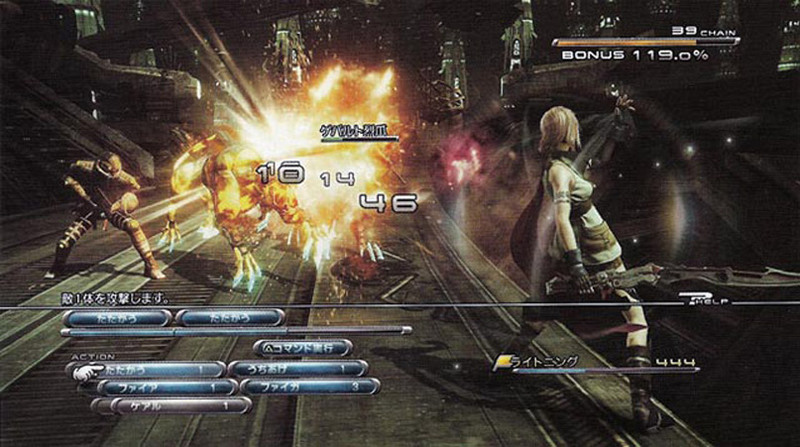 Square-Enix knew that the battle system was a big departure, so they’ve chosen apparently to serve it up in small doses. This makes most of the battles in the beginning trivial, often ending before I even pressed “X” more than a few times. It became rather tedious. Also, some of the tradeoffs–all health is restored at the end of each battle, but if the party leader dies so goes the whole team–don’t make a lot of sense to me. I got the impression that they were trying to be different for different’s sake. Perhaps as it gets more complex it will make sense. Well, Hope DID have a no good, horrible, very bad day. He needs it. I got a brief summary of the story prior to playing the game, so fortunately I wasn’t too confused by all the -Cies flying around: fal’Cie, l’Cie, Cie’th, Cie-Cie-Cie….but I could definitely see (HARHARHAR) where someone going into it blind would be confused. You pretty much need to read the summary found in the instruction manual and possibly even the strategy guide. As for the main story, so far it’s the standard melodrama complete with “NOOOOOO,” angsty protagonists with very fine hairstyles, and vague mutterings about Focus and Destiny–though the dialogue is above par for this genre much of the time. All you have to do is compare the writing and acting in the romance flashback here to the “romantic scenes” in FF8 to see the difference. It’s far too early to tell whether the overall plot will be of quality, though. Clearly, they want to build a rich, developed world (much backstory is contained in the Datapad, like in Mass Effect), and multiple games will be set in it. We’ll see how it fares. The graphics, of course, are stunning, but that’s to be expected from a Final Fantasy game. It would only be news if it were less than spectacular. Cocoon seems inspired by Zion in the Matrix movies in part. Overall, it was a pretty good introduction. It wasn’t quite as boring as other reviews have made it seem, but it did have some dull patches, and I don’t know enough about the characters to care about them too much yet. 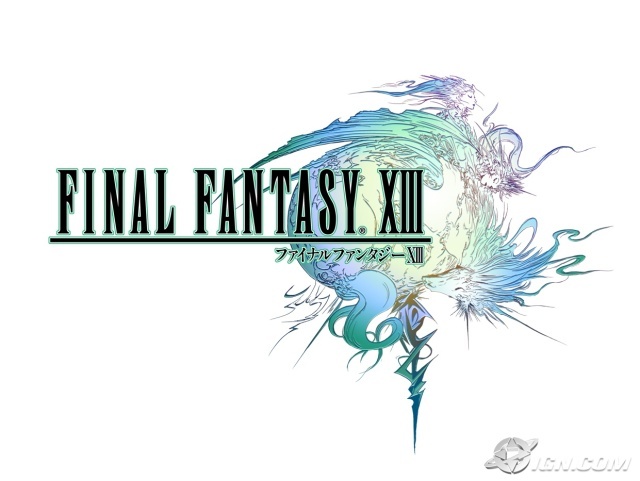 This being a 45 hour game (at least), though, there’s plenty of time to get to know everyone and to explore the world–and to finally see if I can become accustomed to the battle system. Having grown up on the turn based method it took me a while to wrap my head around FF12 and hopefully the slow pace of this new system’s introduction will help me become accustomed to it. As far as linearity, I guess it’s about the same as early areas in FFVII (my all-time favorite RPG, btw). I mean REALLY early areas. I’ve been on a 5-foot wide road this whole time in FFXIII. As far as the Paradigm system goes – I think it’s interesting academically, but the first time I fought those Legged-Fish from Gyo, I got stomped because they all rushed Lightening, I was in attack-paradigm, and for some reason, death is highly contagious in this game. Now I just read that this game will last at least 45 hours… God save me, I have to finish this, but I may not finish with my humanity intact. So the UK version has the JP soundtrack huh? Argh, too bad it’s so expensive. This is why we can’t have nice things!